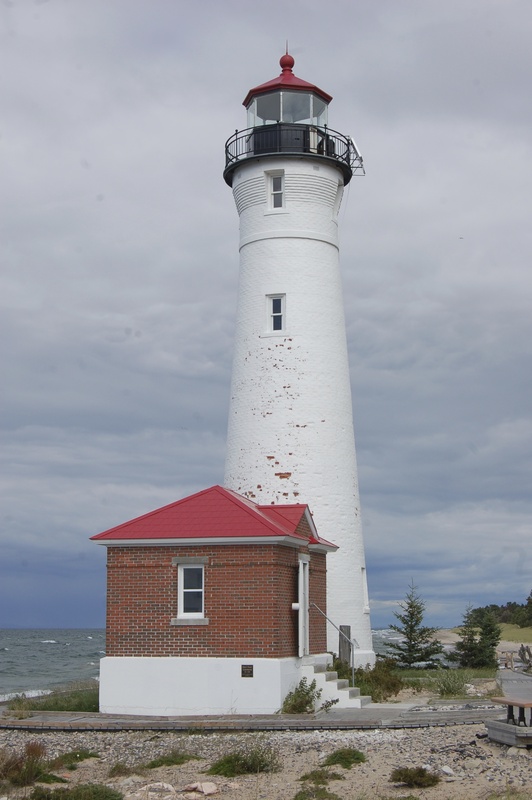 We recently shared our Ultimate Michigan Lighthouse Road Trip: Lower Peninsula post, which gave directions on how to visit 42 or more lighthouses. 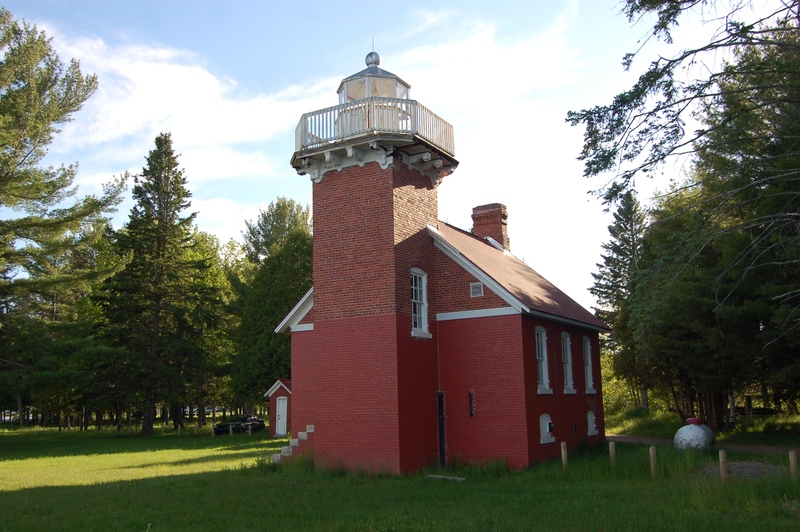 As promised, we now present 34 more lighthouses that can easily be visited with our Ultimate Michigan Lighthouse Road Trip: Upper Peninsula. The Upper Peninsula is a land of scenic beauty, and also one where you won’t encounter as much traffic as in the Lower Peninsula. Much of this trip follows the Lake Superior shoreline, passing by or near Michigan landmarks like the Soo Locks, Pictured Rocks National Lakeshore, Keweenaw National Historic Park and Porcupine Mountains Wilderness State Park. 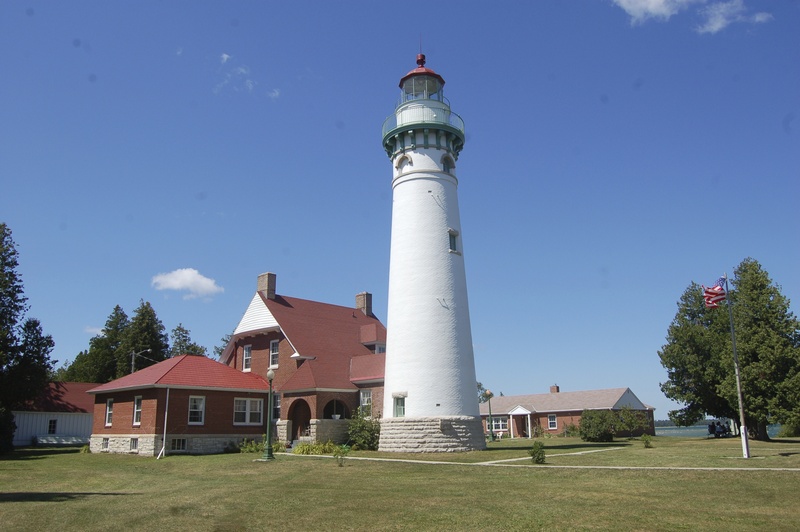 A handful of Upper Peninsula lighthouses are on the Lake Michigan shoreline and this trip will take you all the way from the Michigan/Wisconsin border to the Mackinac Bridge. More than 10 lighthouses on this list are museums or can be entered, and three can even be stayed in. Enjoy your trip, and feel free to email specific questions to travelthemitten@gmail.com – we’ll try to get back to you when possible. Approximate totals for the tour: 1050 miles and 24 hours of drive time. 1. 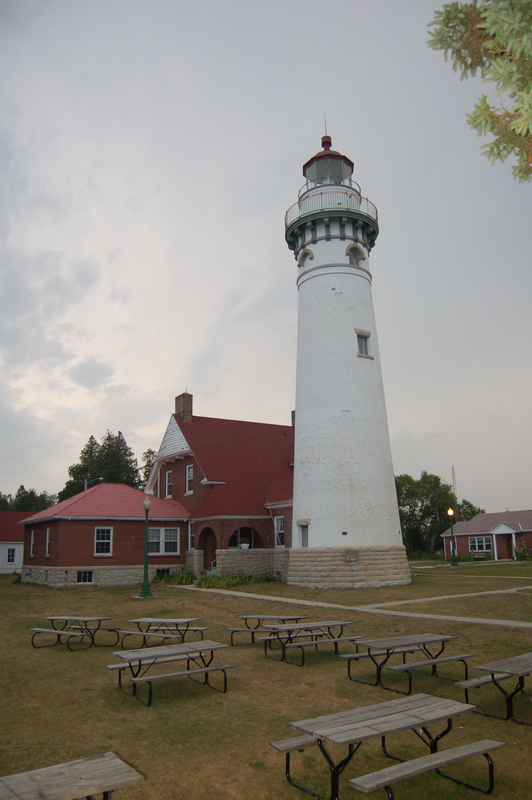 Wawatam Lighthouse – We start our trip in St. Ignace, just across the Mackinac Bridge from the Lower Peninsula. 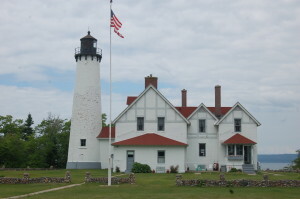 The Wawatam Lighthouse is one of the newest additions to the state’s list of lighthouses as it is a former welcome center light that was installed here in 2006. 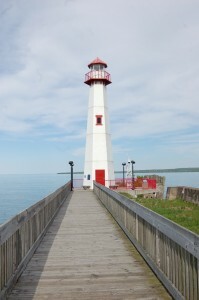 The 52 foot tall tower is white with red trim and it can be accessed from the Huron Boardwalk near Wawatam Park. This lighthouse is named for the SS Chief Wawatam, a railroad ferry that ran from St. Ignace to Mackinaw City from the 1910s to 1980s. Check out our list of 10 Things to See and Do in St. Ignace for more ideas while you’re in the area. 2. 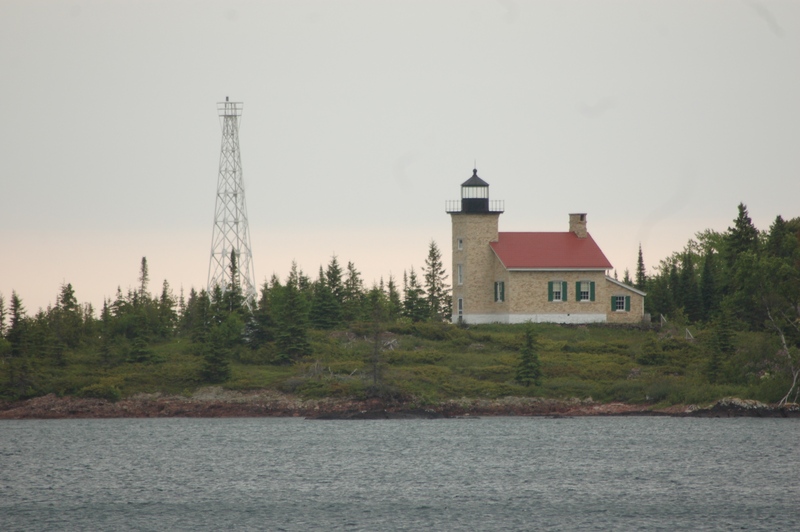 Frying Pan Island Light – From St. Ignace we head north on I-75 to Sault Ste. Marie, home of the Soo Locks that connect Lake Superior to the St. Mary’s River and Lake Huron. This light was moved to its current location in front of the U.S. Coast Guard Station in Sault Ste. Marie from its original location on a small island in the St. Mary’s River near DeTour Village. 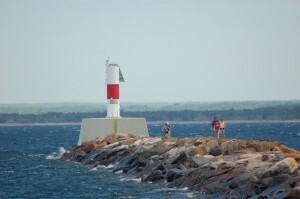 The Frying Pan Island Light tower is a modest 18 feet tall, white with a black lantern room. Check out our list of 10 Things to See and Do in Sault Ste. Marie for more fun ideas while you’re in town. 3. 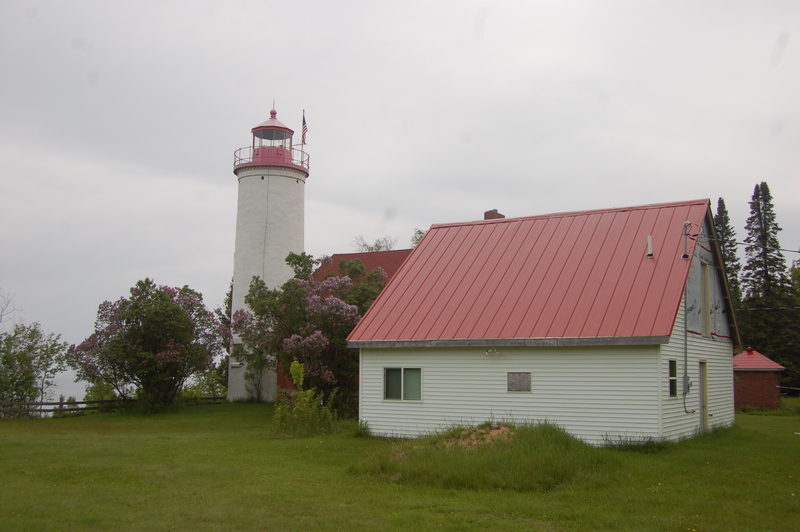 Point Iroquois Lighthouse – We head west to the Hiawatha National Forest and the 1870 Point Iroquois Lighthouse. 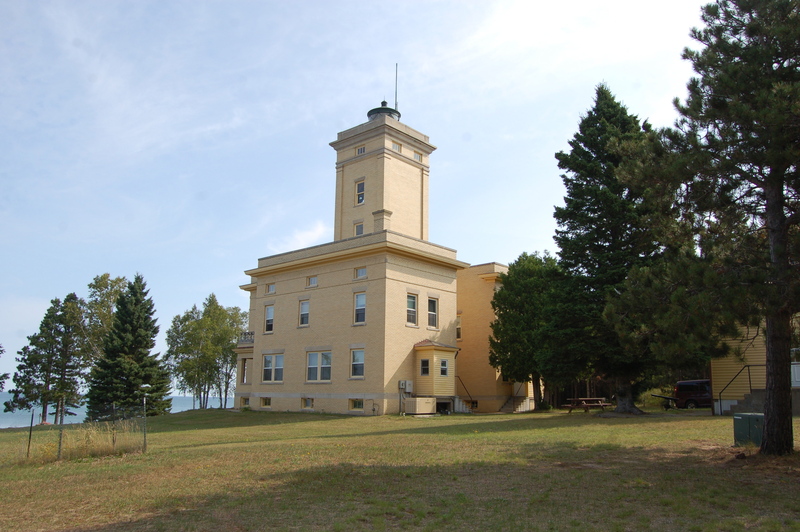 This picturesque building marks the meeting point of Lake Superior’s Whitefish Bay and the east end of the St. Mary’s River, an important point for shipping traffic for many decades. The tower is 65 feet tall and it is attached to a two-story dwelling that is white with a red roof. The National Forest Service operates that dwelling as a maritime museum and keeps the tower open for climbing during summer months. Find out more at http://www.fs.usda.gov/recarea/hiawatha. 4. 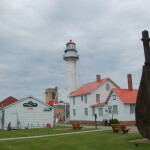 Whitefish Point Light Station – Continuing to follow the Lake Superior shoreline, our next stop is at the Whitefish Point Light Station and the Great Lakes Shipwreck Museum. 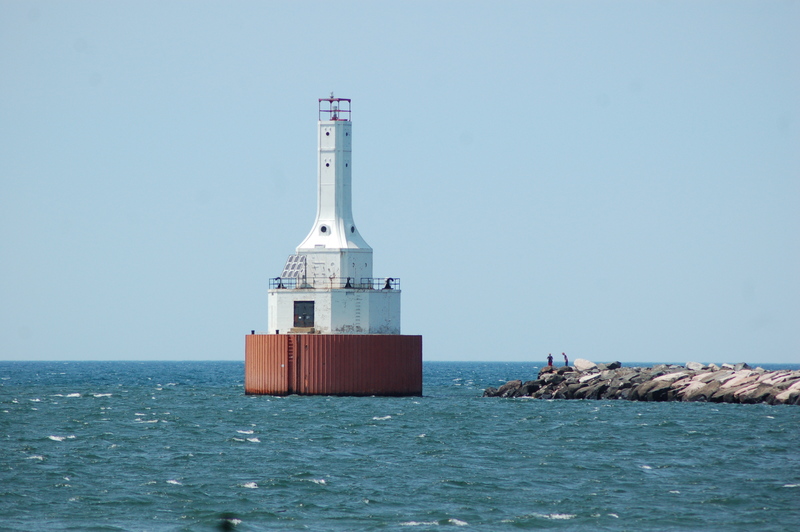 This lighthouse marks a point that all Lake Superior shipping traffic passes, as well as a dangerous area for vessels as it has seen more shipwrecks than any other spot on the Big Lake. 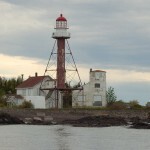 With a history dating back to 1849 this is the oldest light on Lake Superior, and a fairly unique one due to its skeletal tower construction. That design helps it survive in high winds, and ensure that the light at the top of its 76 foot tall tower can be seen. Many light station buildings still survive, including the keepers quarters, fog signal building, oil house, surfboat house and more. Find out more about the museum, which features many SS Edmund Fitzgerald artifacts, at http://www.shipwreckmuseum.com/. Across the parking lot from the lighthouse you’ll find the Whitefish Point Unit of the Seney National Wildlife Refuge, a great spot for birdwatching. After visiting, we’ll head west on M-123, which gives you a great opportunity to make a stop at Michigan’s largest waterfall at Tahquamenon Falls State Park. 5. Crisp Point Lighthouse – The toughest lighthouse to reach on this trip is our next stop. The route to the Crisp Point Lighthouse is one best made after dry weather and in a vehicle with high clearance, as it covers 18 miles of back roads that get narrow and sandy in spots. The reward is an unspoiled stretch of Lake Superior shoreline and views from the top of a 58 foot tall tower. This lighthouse was in real danger of being lost forever to the elements before the Crisp Point Light Historical Society stepped in and secured it. They rebuilt the building that is attached to the tower, put in boardwalks and erosion controls, and even recently built a visitor center/gift shop/restrooms building. Volunteer keepers stay here during the summer, keeping the tower open for climbing. Take your time and soak in the surroundings at this serene and beautiful place. Find out more at http://crisppointlighthouse.org/. If you’re making this trip with children, a great side trip is at Oswald’s Bear Ranch, home to more than 20 rescued black bears. Check out our Photo Gallery to see just how close you can get to these bears. 6. 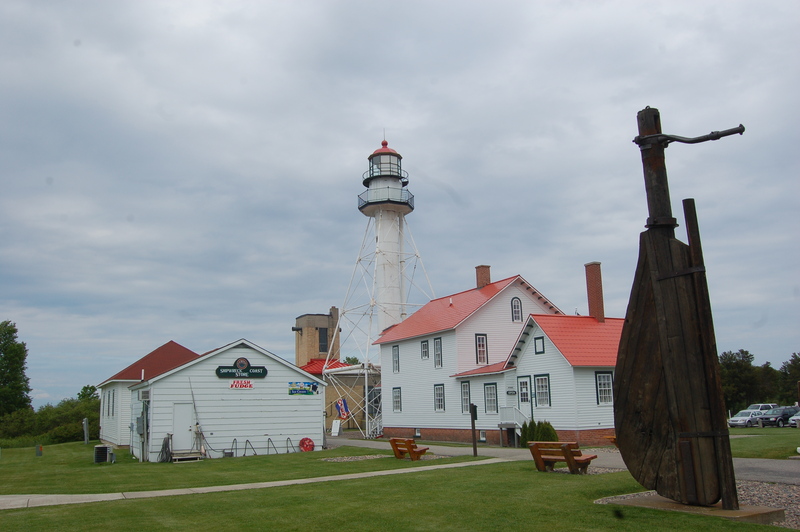 Grand Marais Inner Light – Located near the west end of the Pictured Rocks National Lakeshore, Grand Marais was a harbor of refuge for ships on Lake Superior, and their only chance for shelter between Munising and Whitefish Point. A channel connects the harbor to the lake, and these two range lights stand at its ends. The Inner Light is the taller of the two, with its skeletal tower standing 55 feet tall. 7. Grand Marais Outer Light – Both lights are painted white, and the outer light is 33 feet tall but less visually appealing. You can easily walk out to visit both lights up close. The former keepers quarters building that sits nearby is now a maritime museum (http://historicalsociety.grandmaraismichigan.com/) and attractions like the Pickle Barrel House and Sable Falls are within a mile or two of the range lights. 8. 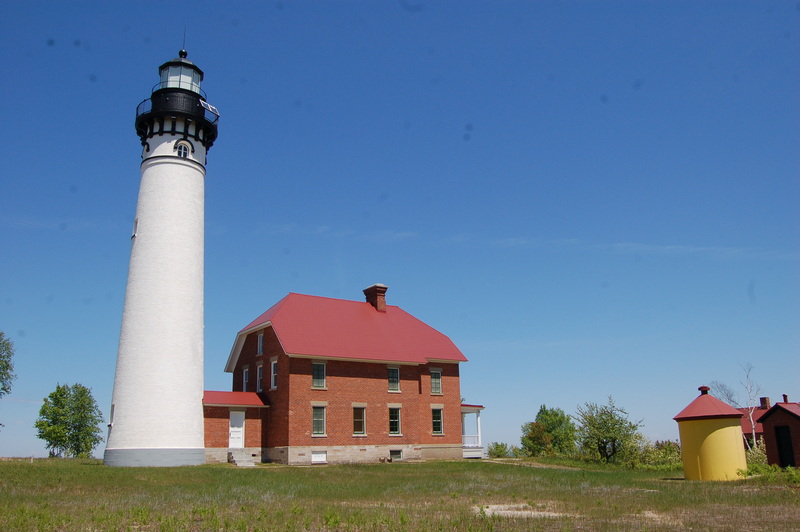 Au Sable Point Lighthouse – We now move into the Pictured Rocks National Lakeshore, which is home to some of the state’s best natural beauty and stunning views. The Au Sable Point Lighthouse is reached after a 1.5 mile hike through the woods along a wide and well-maintained trail. This lighthouse went into service in the 1870s, and warns of a dangerous reef that has claimed many ships – two shipwrecks can be seen in the sand and shallow water on the beach just south of the station. The white tower is capped with a black lantern room and it stands 87 feet tall, attached to a brick two-story keepers dwelling. Several other buildings have survived, including the oil house, a boathouse, garage, a second keepers dwelling and two outhouses. During the summer, the National Park Service has staff on hand for tours of the lighthouse and tower climbs. Find out more about this opportunity at https://www.nps.gov/piro/learn/historyculture/ausablelightstation.htm. 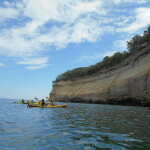 Check out our Photo Gallery: Pictured Rocks National Lakeshore for some other sites worth checking out as you make your way towards Munising. To see a bonus lighthouse from a distance head to the Sand Point Beach at Pictured Rocks National Lakeshore in Munising. From there you can view the Grand Island East Channel Lighthouse. You can view both the Grand Island East Channel and Grand Island North Lighthouses on the Riptide Ride, and the East Channel Lighthouse can be seen from the Glass Bottom Shipwreck Tours and the Pictured Rocks Cruises. 9. 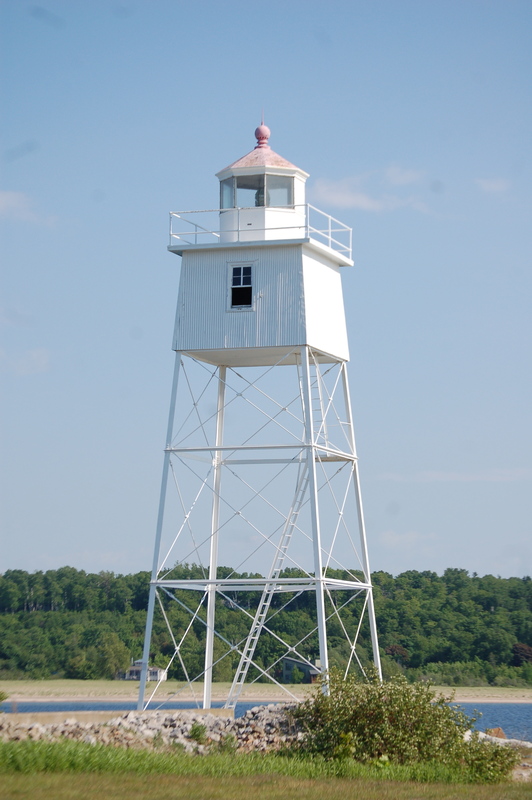 Munising Front Range Light – The next two lights we visit work together to guide mariners into Munising Bay from Lake Superior, navigating the dangerous Grand Island East Channel. The Front Range Light is a 24 foot tall white tower with a red-capped lantern room. It stands next to a former dwelling that is now used as National Park Service offices. You are able to visit this light at any time, and hopefully someday it is open as a museum. Read up on the history of these range lights at https://www.nps.gov/piro/learn/historyculture/upload/MunisingRangeLights2012.pdf. 10. Munising Rear Range Light – We follow Hemlock Street up the hill to its end, where the 15 foot tall Rear Range Light sits in the woods. The focal height of this light is well over 100 feet due to it being on the top of a hill, and its white tower and red-capped lantern room stand out in front of the green trees. There is parking on street here, please be respectful as there is a private residence next to this beacon. 11. Grand Island Harbor (Christmas) Rear Range Light – Five miles west of Munising we find another pair of range lights that are referred to by many different names (Bay Furnace Range Lights, End of The Road Range Lights, Christmas Range Lights). The rear range tower peeks above the trees on the south side of M-28, just across from the Welcome to Christmas sign. This 65 foot tall tower is black on the bottom and white on the top, capped with a black lantern room. The National Forest Service has a nice brochure at http://www.fs.usda.gov/Internet/FSE_DOCUMENTS/stelprd3797168.pdf that has information on summer tours. 12. Grand Island Harbor (Christmas) Front Range Light – Across the road from the rear range sits the cylindrical white Front Range Light, which stands 20 feet tall. 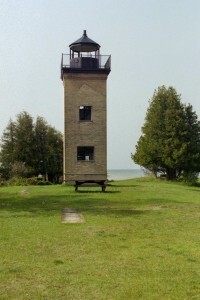 A front range that was similar in design to the ones at Presque Isle, MI and Bailey’s Harbor, WI once stood here, with this light going into service in 1968. Be sure to stop by Santa’s Workshop as you pass through town, and if you have the time check out the Bay Furnace Historical Site as well. 13. Marquette Lower Harbor Breakwater Light – Our trip continues westward as we head for Marquette, home to the largest population in the Upper Peninsula (21,000 +) as well as three noteworthy lights. 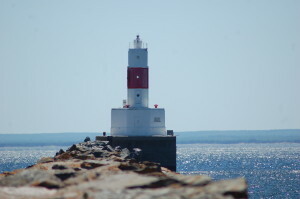 The Breakwater Light is a simple white and red cylindrical tower that replaced a square steel tower in the 1980s. You can walk out to this light by following the path near the maritime museum, with good views of the old ore dock, the U.S. Coast Guard station and the Marquette Harbor Lighthouse along the way. 14. 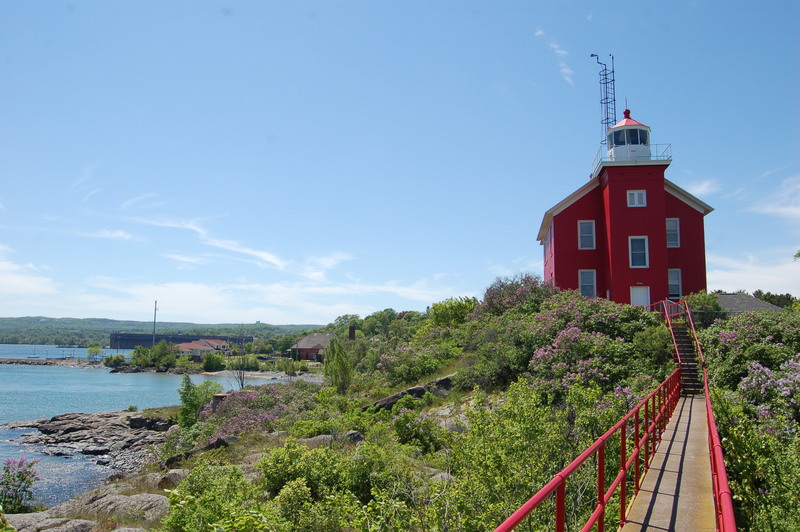 Marquette Harbor Lighthouse – One of the Upper Peninsula’s most iconic lighthouses, the Marquette Harbor Lighthouse stands out with its bright red color and church-style construction. This lighthouse’s tower reaches 44 feet, though its focal height is more than 70 due to the rock outcropping that it sits on. It was built in the 1860s to replace earlier structures, and continues to guide ships today. The Marquette Maritime Museum offers guided tours of the lighthouse in the summer months, we were fortunate to get to visit in June of 2016 and would recommend a tour to anyone visiting the area. 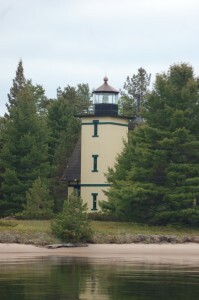 The Marquette Harbor Lighthouse can also be viewed from the beach at McCarty’s Cove. 15. 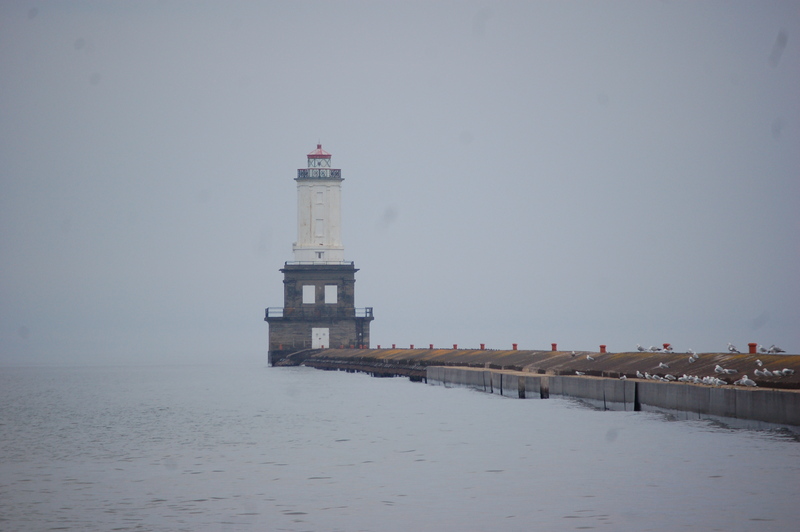 Presque Isle Breakwater Light – Moving north from the harbor lighthouse, we follow the lakeshore past the still-operational ore docks to Presque Isle Park, a more than 300 acre gem of natural beauty. The breakwater light can be found at the southern end of Presque Isle, and it still guides ships in to the ore docks – this is a great place to watch freighters load. The light is white with a red band in the middle, and it stands more than 50 feet above the water line. You can walk out to this lighthouse, but as many signs warn please use good judgment and caution when weather conditions are not ideal. 16. 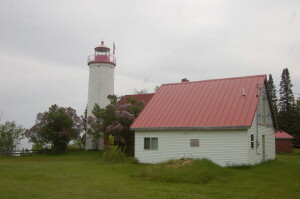 Big Bay Point Lighthouse – The drive north on CR-550 from Marquette is one full of impressive scenery, and it comes to an end in the small community of Big Bay. The movie Anatomy of a Murder was filmed here, and Henry Ford once had a sawmill here. The Big Bay Point Lighthouse was built in 1896, and while it is only 64 feet tall it stands on top of a tall bluff. The focal height of the lighthouse is more than 100 feet, and its still-active signal can be seen for nine nautical miles. The tower rises out of one corner of a square brick dwelling that now operates as a bed and breakfast. The grounds are open to the public as long as respect is shown to guests, if interested in booking this lighthouse check out http://www.bigbaylighthouse.com/home12.html. This is the first of three Upper Peninsula lighthouses that are bed and breakfasts, but this is the only one that is still operational. 17. 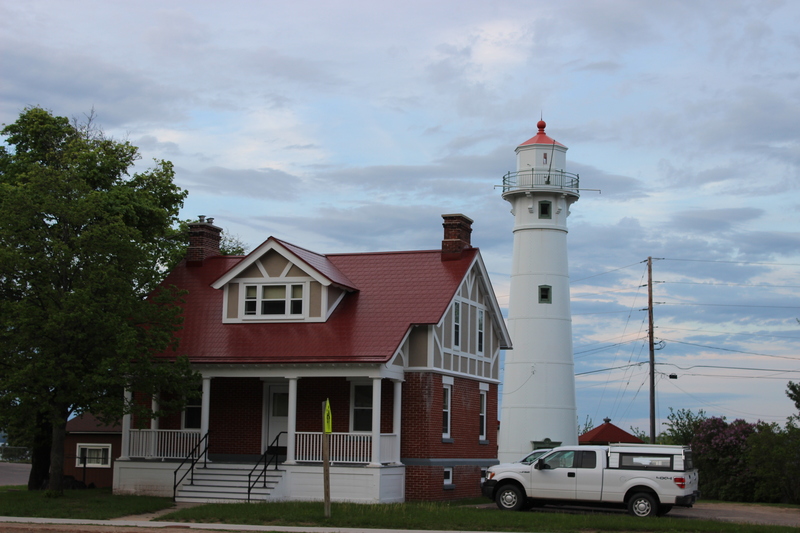 Sand Point Lighthouse (Baraga) – An hour and a half of driving takes us through the heart of Michigan’s moose country and to the Keweenaw Bay Indian Community campground and recreation area. 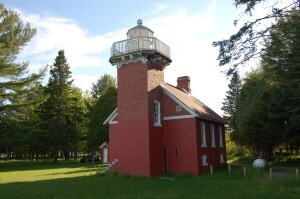 Built of red brick and featuring a 36 foot tall tower capped with a white octagonal lantern room, this lighthouse served from the 1870s through the 1920s. The structure is in good shape for its age, and while it is not open to the public for tours you can still visit the grounds to photograph it. 18. 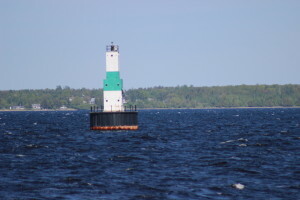 Keweenaw Waterway Lower Entrance Light – From Baraga we head north and enter the Keweenaw Peninsula. This was the site of extensive copper mining activity, and we will pass many ruins and remnants of that era as we visit our next few lighthouses. The Portage River separates the peninsula from the mainland, and was busy with shipping traffic many years ago. Most traffic now is pleasure craft and fishing boats, but lighthouses remain at each end of the river as a reminder of the past. On the east end we find the Keweenaw Waterway Lower Entrance Light, an 1920s octagonal tower roughly 30 feet tall that sits at the end of a long pier. The light tower is white with a red-caped lantern room, and it rests on a concrete base. White City Park and Beach in Jacobsville is the access point for this light, as always we remind visitors to use caution and keep an eye on the weather when walking piers of boardwalks. 19. Jacobsville Lighthouse – Just down the road from the entrance light we encounter the second bed and breakfast of this trip at a lighthouse that traces its history back to the late 1860s. It served until the 1920s when the entrance light rendered it obsolete. A 50 foot white tower capped with a red lantern room, connected to a two-story red brick dwelling. Find out more about staying here at http://www.jacobsvillelighthouse.com/index.html, and be sure to bring along some money for a grounds and tower tour if the owners/hosts have time to show you around – all money goes back into the upkeep of this historic lighthouse. 20. 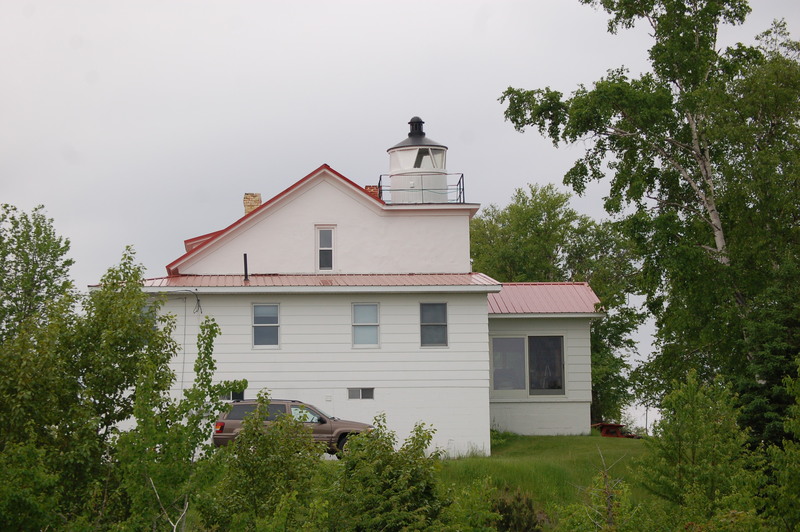 Mendota (Bete Grise) Lighthouse – Plans for a lighthouse along the canal that connects Lake Superior and Lac LaBelle date back to the 1860s, but it wasn’t until the 1890s that one was actually constructed. The Mendota Lighthouse is a square, yellow building with a 42 foot tall tower rising above a gabled roof. It is best seen by boat, but you can get a view from the end of the road at the canal. 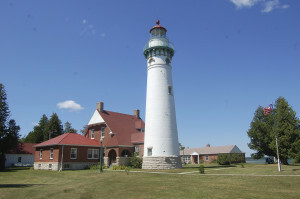 The owners maintain a website with great information about their ongoing preservation efforts at http://www.mendotalighthouse.com/Mendota_Lighthouse/Welcome.html. We added two lighthouses to our trip here thanks to a fishing and sightseeing cruise with Sand Point Charters. 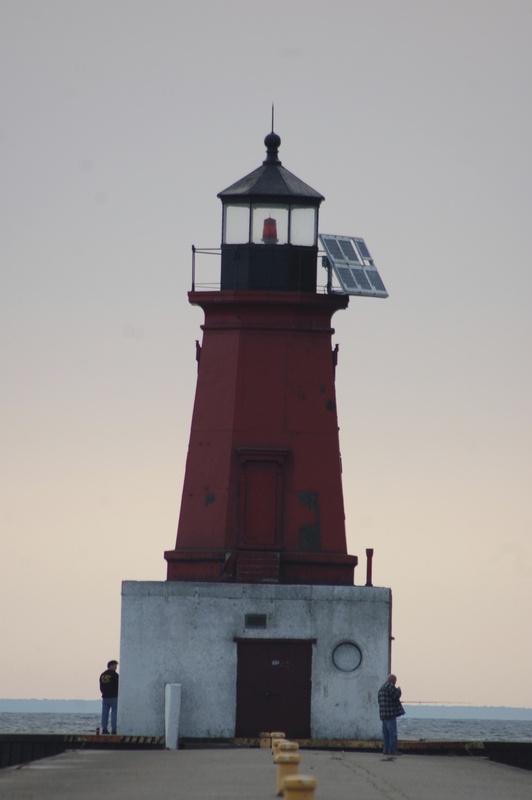 Check out our Photo Gallery from that trip for pictures of the Manitou Island Lighthouse and the Gull Rock Lighthouse, Bare Bluff and the Lower Montreal Falls. Captain Brian also makes trips out to Stannard Rock Lighthouse (known for great fishing), and we look forward to returning soon to make that journey. 21. Copper Harbor Lighthouse – We head north on US-41 past the Central Mine Historic District and the Delaware Mine to reach Copper Harbor, the northernmost point on the Keweenaw Peninsula. 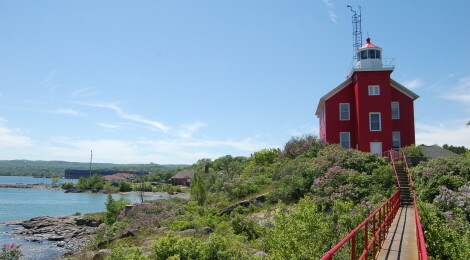 This lighthouse was built in 1866 and is brick with a black lantern room and a red roof on the attached dwelling. The tower is 42 feet tall and tours run from the municipal marina out to the lighthouse during summer months. This light is part of Fort Wilkins Historic State Park and can be viewed from a parking area across from the fort. The Copper Harbor Range Lights are across Fanny Hooe Creek from this parking area. Check out our list of 12 Things to See and Do in Copper Harbor for more great sites in the area. 22. 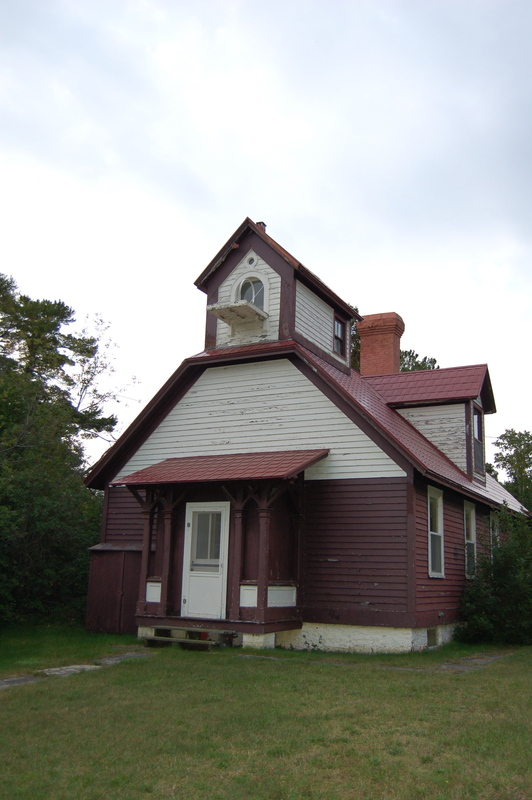 Copper Harbor Range Lights – The Copper Harbor Rear Range Light is pictured above, and is a schoolhouse-style range light, and just in front of that you will find a white steel skeletal tower (replaced the lantern in rear range building in 1960s). 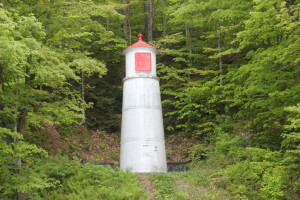 A short, white reflective panel mounted on a red tank is the front range light, dating back to the late 1920s. It is possible to walk around and view all of these lights, with respect to the fact that the dwelling is sometimes used to house state park employees. 23. 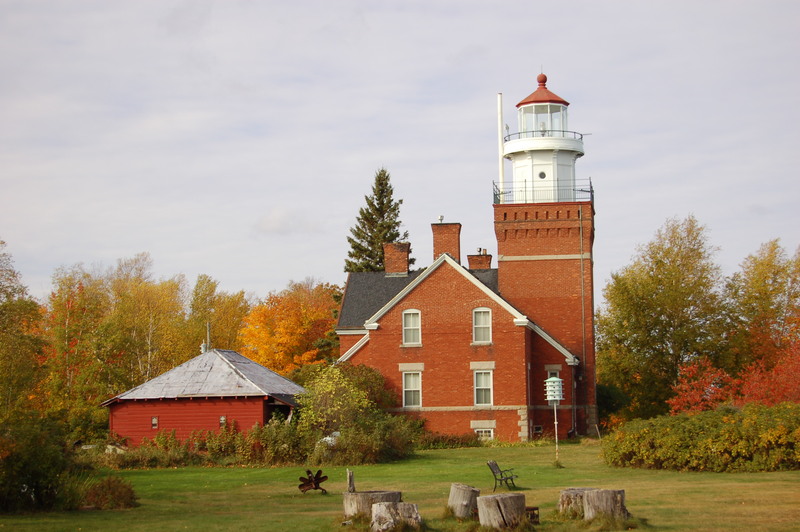 Eagle Harbor Lighthouse – We next move to what I consider to be the most picturesque lighthouse on the Keweenaw Peninsula, the Eagle Harbor Lighthouse. With its mixing of red and white brick and location atop a rocky point, this one always impresses. This lighthouse was built in 1871 and the tower stands 44 feet tall. The Keweenaw County Historical Society operates this station as a museum in cooperation with the Keweenaw National Historic Park, find out more at http://www.keweenawhistory.org/sites/lighthouse.html. The museum complex also includes a fishing museum, county historical museum, and a maritime museum in the old fog signal building. The old Eagle Harbor Life Saving Station is just a few miles down the road on the other side of the harbor. 24. Eagle River Lighthouse – The former Eagle River Lighthouse has been a private residence for years, but it can still be viewed from Main St. on the opposite side of the river. The copper boom made Eagle River a busy port and the lighthouse served from the 1850s to the 1870s when the boom fizzled. 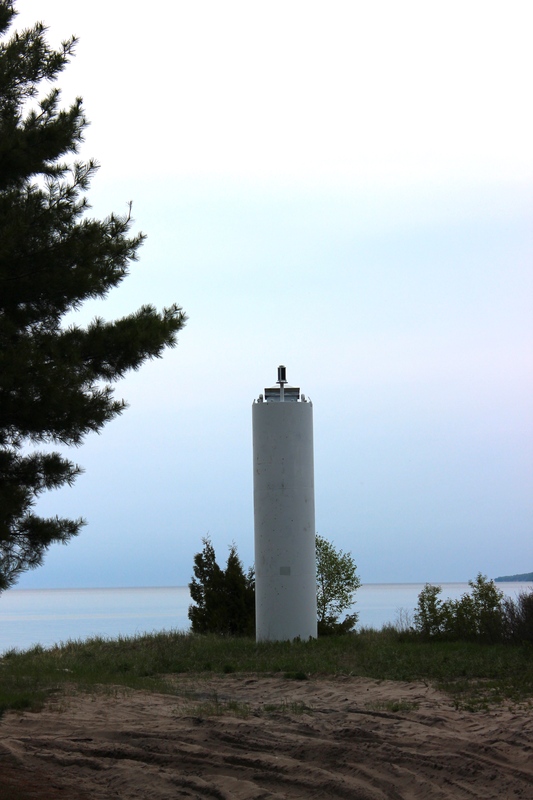 The light only stands 24 feet high but its position on a bluff improved its visibility on Lake Superior. Be sure to check out Eagle River Falls and the two historic bridges next to the falls while you’re here. 25. Sand Hills Lighthouse – The third and final bed and breakfast on our Upper Peninsula tour is the incredibly unique Sand Hills Lighthouse. This lighthouse was constructed in 1919 to help cover the gap left by the Eagle River Light no longer being in service, and it features a square 70 foot tall tower rising out of a large square two-story building that looks more like an apartment complex than a lighthouse. After the light was automated this facility was used for Coast Guard training during World War II. Public tours are available once a day at 3:04 p.m. for a small fee, find out more about booking rooms at http://www.sandhillslighthouseinn.com/. 26. Keweenaw Waterway Upper Entrance Light – At F.J. McLain State Park we find the light at the other end of the Portage River from the one we previously visited in Jacobsville. 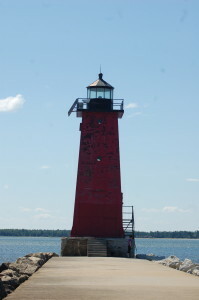 This 50 foot tall light sits at the end of a breakwater, and features a tapering white tower rising above a red concrete base. It is a bit more difficult to walk all the way out to this lighthouse than in other spots where the breakwater is flat, but not impossible if conditions allow. 27. Ontonagon Lighthouse – The last two Lake Superior lighthouses we will visit are found in Ontonagon, which was at one time a very important port. 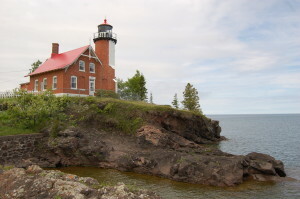 There structural similarities between the Ontonagon Lighthouse and the ones at Copper Harbor and Sand Point (Escanaba). The lighthouse is constructed of brick, with a three story tower rising up from the one and a half story dwelling. The lantern room is black and the tower stands 34 feet tall. 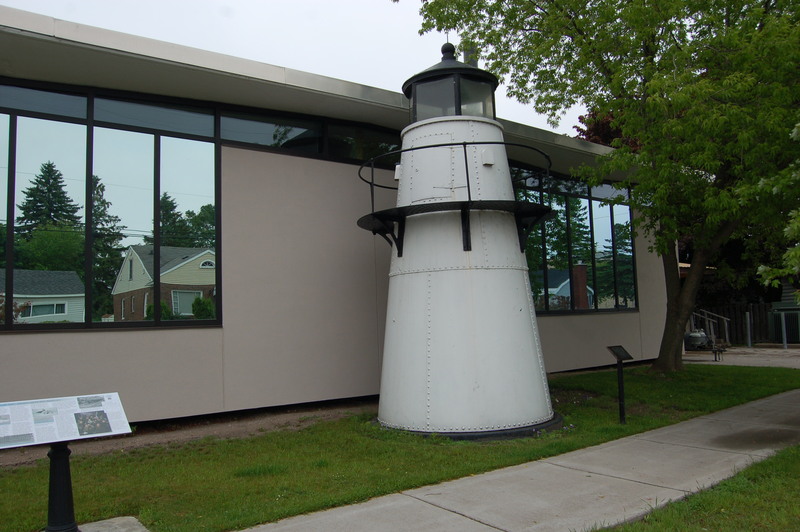 You can view this lighthouse from a walking path that starts near the end of River St. or you can arrange for a tour through the Ontonagon County Historical Society at their museum a few blocks down the street. 28. 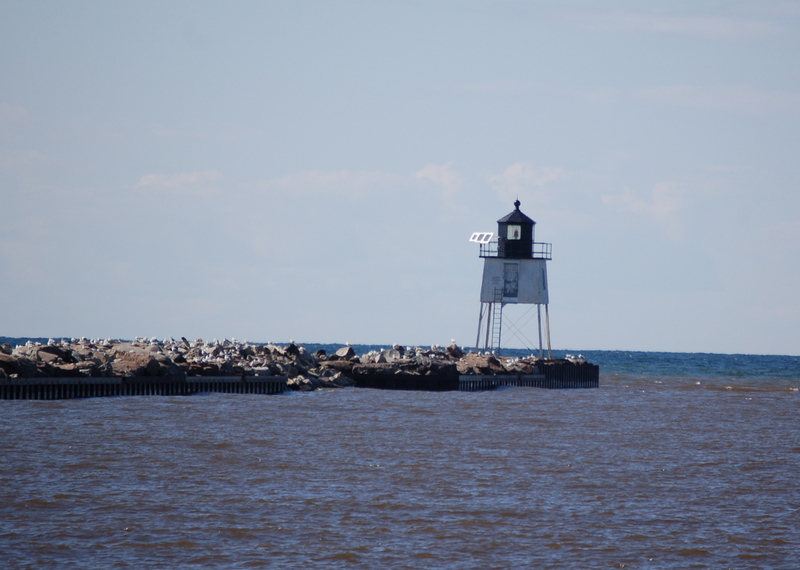 Ontonagon West Pierhead Light – This simple square steel tower is white with a black lantern room, and it stands 26 feet tall and the end of a long pier that marks the entrance to the Ontonagon Harbor from Lake Superior. It can be viewed from the same parking area as the Ontonagon Lighthouse. 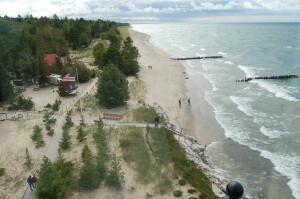 Our final six stops are on the Lake Michigan shoreline. The trip from Ontonagon down to Menominee will take between three and four hours and it covers more than 180 miles. Some stops along the way that we suggest checking out Bewabic State Park, DeYoung Family Zoo, and the Menominee River State Recreation Area, Piers Gorge Unit. 29. 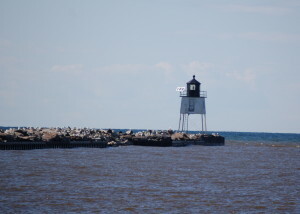 Menominee North Pier Lighthouse – Menominee is the fourth largest city in the Upper Peninsula by population, as well as its southernmost city. Here the Menominee River forms the border between Menominee and Michigan from Marinette, Wisconsin. 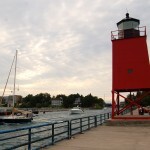 The North Pier Lighthouse marks the point where the river enters Lake Michigan’s Green Bay, and it is a 34 foot tall octagonal tower pained red with a black lantern room. The light sits on a square white concrete base at the end of the pier, which can be accessed from Lighthouse Ann Arbor Park. 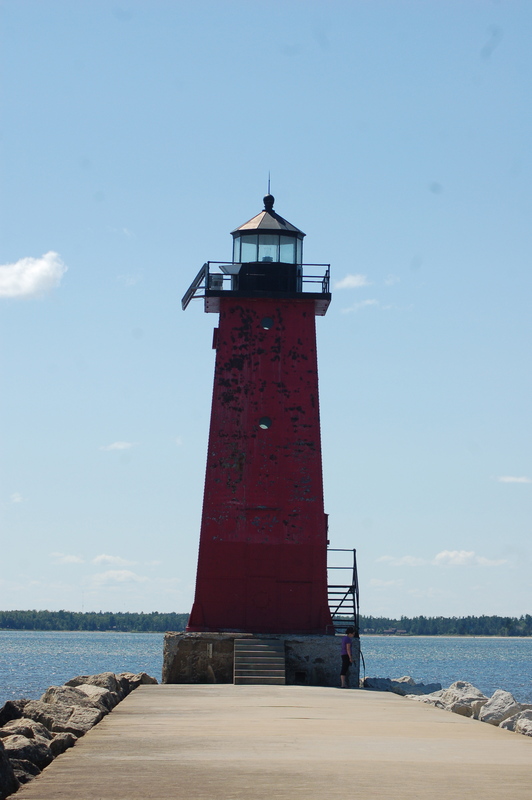 Those familiar with the Cheboygan Crib Light in the Lower Peninsula will notice the structural similarities between the two lights. 30. 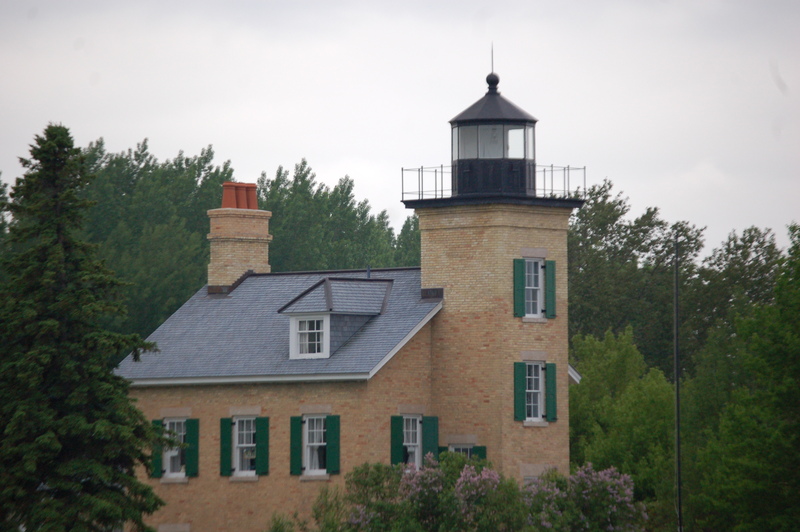 Sand Point (Escanaba) Lighthouse – Escanaba became an important Great Lakes port in the 1860s thanks to railroad expansion and iron ore coming down from the north, which led to the construction of the Sand Point Lighthouse in 1868 to warn vessels of the dangerous sand shoals in the bay. Like several other lighthouses we’ve seen, Sand Point features a one and a half story building with a brick tower rising above the roof. Painted white with a black lantern room and a red roof, the tower here is 44 feet tall. Unlike other lighthouses, for some reason the tower here is on the land side rather than the lake side. The Delta County Historical Society keeps this lighthouse open as a museum, so you can enter and climb the tower. Find out more at http://deltahistorical.org/?page_id=172. While you’re in town, consider grabbing a meal and some brews at Hereford & Hops or pay a visit to our friends at Upper Hand Brewery. 31. 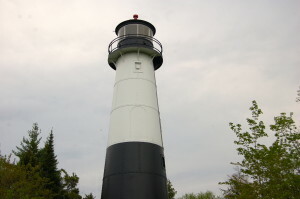 Escanaba Crib Light – When the Sand Point Lighthouse was deactivated in 1939, this simple crib light was constructed in Little Bay de Noc to take its place. It is white with a green band and marks a shoal that presents a danger to mariners. Though it is a bit offshore this light can be viewed from Sand Point or the nearby park on Ludington St.
32. Peninsula Point Lighthouse – Across the bay from Escanaba we find the Peninsula Point Lighthouse tower, all that remains of a structure that once looked a lot like the Sand Point Lighthouse. The square brick tower stands 40 feet tall and is capped with a black lantern room, and it is found at the tip of the Stonington Peninsula. This light falls under National Forest Service control, and the tower is usually open for climbing. On the long drive out to the point you will find conservation areas as bird and butterfly migrations happen here each year. Check out the NFS page for more information, at http://www.fs.usda.gov/recarea/hiawatha/recarea/?recid=13320. Between here and Manistique you have the chance to check out two of our favorite Upper Peninsula state parks: Fayette Historic State Park and Palms Book State Park, home to the Big Spring Kitch-iti-kipi. 33. 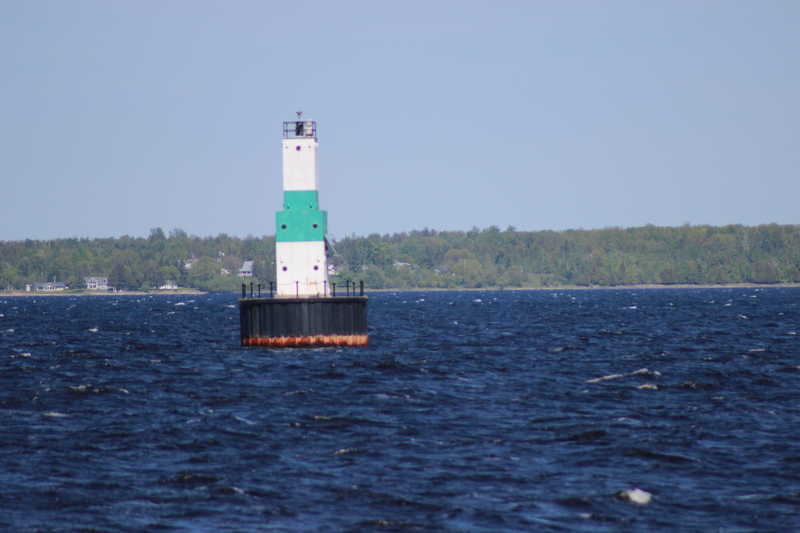 Manistique East Breakwater Light – We are now in the home stretch and headed east back towards St. Ignace. Manistique was founded in the 1880s, centered around the Manistique River that flows through town before emptying into Lake Michigan. 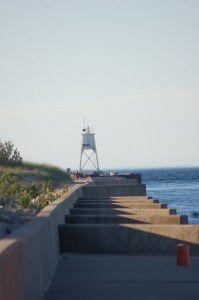 The East Breakwater Light was constructed in 1916 to mark the entrance to the harbor at a time when timber and iron shipments kept the area bust. It is a square pyramidal metal tower, painted red with a black lantern room. You can walk out to this 35 foot tall tower from the boardwalk that starts at Lakeview Park. 34. Seul Choix Point Lighthouse – Our final stop is in Gulliver, home of the beautiful and possibly haunted Seul Choix Point Lighthouse. 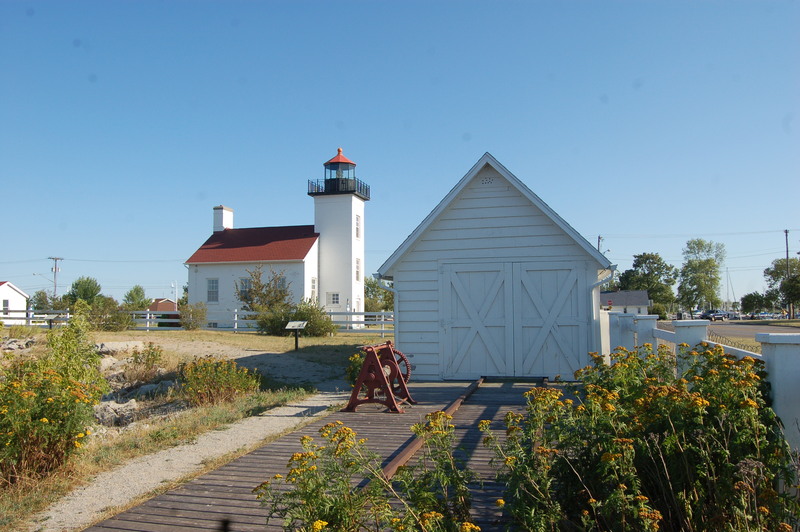 When this lighthouse was constructed and put into service it was the only beacon on a 100-mile stretch of Lake Michigan shoreline. Seul Choix marked a harbor of refuge, which was important due to the early-season and late-season storms that often hampered maritime traffic. Built in 1895, the lighthouse features a 77 foot tall tower that is painted white with green trim and a red-capped lantern room. This tower is attached to a two-story dwelling made of brick, with Italianate architecture. Other surviving buildings on the grounds include the fog signal building, boathouse, oil house, outhouses, and a second keeper’s dwelling. The Gulliver Historical Society operates this lighthouse as a museum and offers tower climbs to visitors, find out more at http://www.greatlakelighthouse.com/. You can also get a distant view of the St. Helena Island Lighthouse from the roadside park on US-2 roughly six miles west of St. Ignace.